Attn: Bridget Carlisle, PO Box 9005, Bartow, FL 33831 or fax to (863) 534-0001, Attn: Bridget or email bccarlis@ufl.edu. We currently have 274 members. The largest of any association in Florida. We need your help. If you know of anyone that would like to join and help support a great industry, the applications are available using the link above. Please help me continue to make this the biggest association in the state. We now have applications for a County Associate Member. This would be for a company or a business in our county that does not own cattle. That has an Agricultural business, or does business with Agricultural people, wants to be involved with the county, be on there mailing list. So if you are a business that would like to be involved, and get invited to all the county functions please let us know. We are interested in what you think. If you have an idea that you would like for us to organize and do, contact us! This is your association; we are here to help. 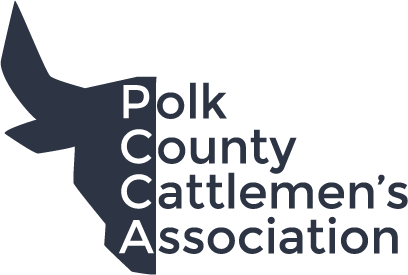 Support of the Polk County Cattlewomen, Inc.